When I published a new comic every day, I had a buffer built up so that it would cover any days when I didn't make new strips. Now that I'm doing just one new "strip" a week, I haven't been able to build up a buffer - pretty much just writing exactly one annotation a week. Unfortunately, this weekend I have possibly the worst head cold I've ever experienced. Sore throat, blocked nose, blocked ears, pounding headache, that dizziness thing when you stand up. Which means I am going to take things easier than normal and not write anything beyond this small note today. At least I can give you a nice photo of a garden. 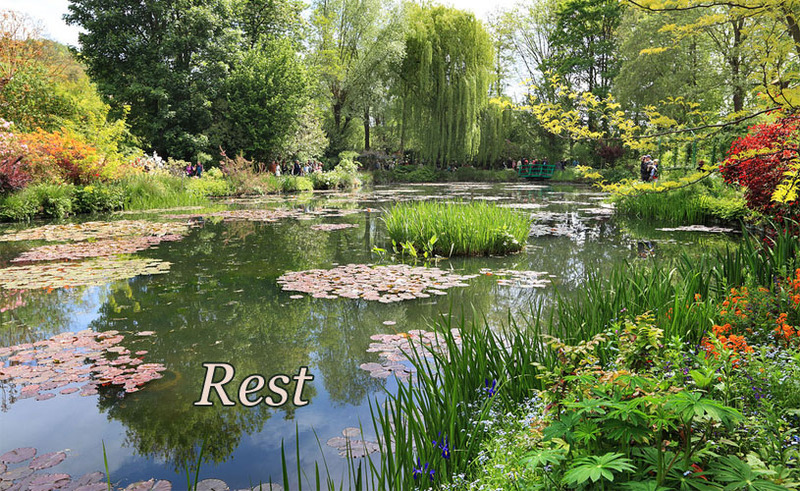 This is Claude Monet's garden, in Giverny, about an hour outside of Paris. It's been kept meticulously by a foundation and is a wonderful place to visit, particularly if you like impressionist painting, as I do. I'm just pondering how little we've advanced in our treatment of colds over the centuries. Although I suspect that in the past my convalescence would have something to do with poultices, and I'm sure hot honey, lemon juice, and rum is a good sight more enjoyable. Last Modified: Sunday, 16 September 2012; 15:17:25 PST.